I've used chocolate transfer paper once or twice to embellish molded chocolates but I've never been confident enough to use it as a cake wrap. Intimidation held me back and I have never been a fan of throwing away money - specifically $7 for a single transfer sheet if I flubbed the job. Maybe it was the recent success over poured fondant that has given me the confidence to try again. Maybe it was the simultaneous discovery of chocolate-honey cake and a cheerful honeycomb chocolate transfer. I don't know, but in the end the task was much easier than I'd made it out to be in my head. As expected, my first-time wrap results are not perfect. Novice mistakes are apparent. 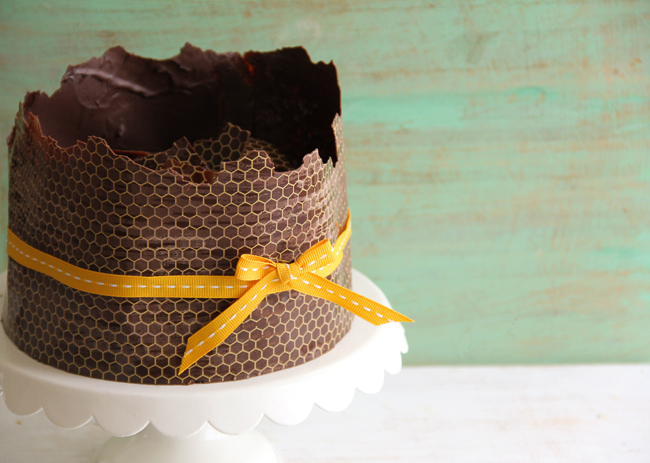 The chocolate bloomed a little due to overheating, and the honeycomb pattern became skewed in places. Even so, I think if you are good at following directions, you will be at least as successful as I was with this endeavor; which, in my opinion, is not too shabby! The honey glaze on the cake has a nice stickiness to it. Plenty enough to hold the chocolate wrap in place. I've made a short video of the glazing and transfer paper wrapping process in case you're wondering exactly how to execute the technique. I will say this. The instructions that came with the transfer said to cut the paper to fit the side of the cake exactly. I had something more sculptural in mind, so I didn't follow that suggestion and my chocolate wrap towered high over the top of the cake. I can see how it would be much easier to fit the sheet to the cake's exact measurements, so novices may want to follow the manufacturer's rule on the first go around. You can find an excellent resource for chocolate transfer sheets here. 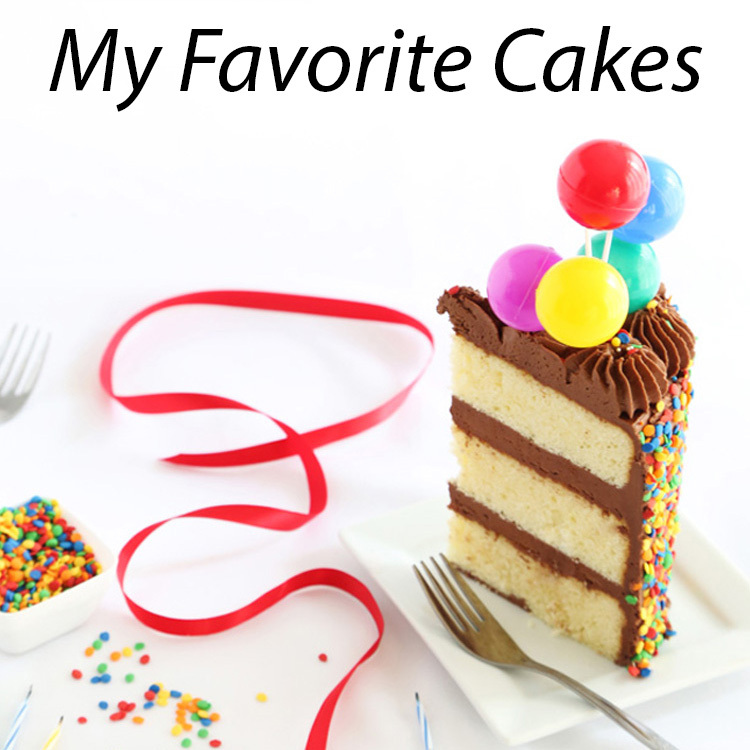 One more thing, I made this cake in my food processor! If you prefer a stand mixer, you can find the instructions here. 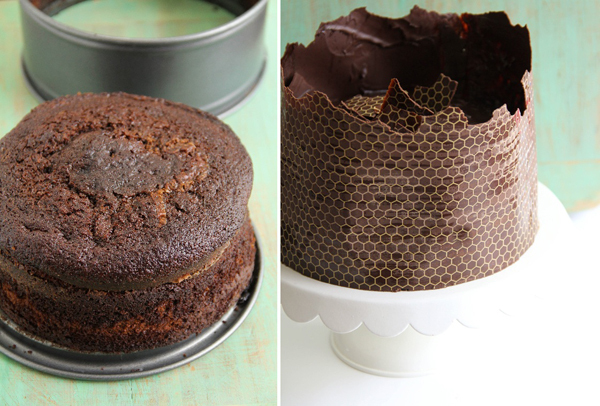 Note: I made this cake in a 6” pan so the chocolate transfer sheet would better fit around the circumference of the cake. The extra batter was baked into cupcakes. The directions below are for the 6” cake. Grease a 6” spring-form pan with shortening and line bottom with parchment paper circle. Grease parchment. Melt 4oz. of chocolate in the microwave at 30 second intervals until smooth. Set aside. In the bowl of a food processor fitted with steel blade add sugar, butter, honey, eggs, flour, baking soda and cocoa. Process in a few short bursts until just combined. Add melted chocolate and process again briefly. With the processor running, pour in the hot water. Process until smooth. Batter will be thin. Fill the spring-form pan 2/3 full and place into the oven. Bake for 1 hour to 1hour 15minutes. (Remaining batter can be used for cupcakes.) When done, the cake will spring back when pressed in the center and a toothpick tester should come out clean. Let cool completely in the spring-form pan. In a small saucepan, bring water and honey to a boil. Remove from heat and add chocolate chips. Whisk until well combined. Add confectioners’ sugar and whisk again until smooth. Run a knife between the cake and spring-form pan to loosen it, then unclip the pan and remove the ring to make sure it removes cleanly. Pick up cake and remove the parchment circle, then place the cake back on the spring-form base. Put the spring-form ring back around the cake, but don’t clip it tight. Place cake in cake pan on a large length of wax paper. Pour glaze over cake inside pan, letting the glaze run down the sides of the cake. Let stand for 10 minutes, and then remove the cake ring. The glaze will flow around the sides of the cake. 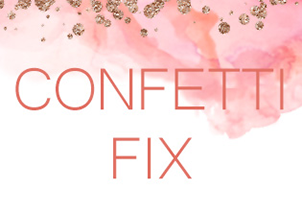 Using a spatula, transfer the cake to a serving platter lined with strips of wax paper. Using an X-acto knife or pair of scissors, carefully cut transfer paper into two long pieces (two 5x16 pieces). Measure cake and trim transfer paper to fit sides of cake exactly (or don’t – if you like my presentation). You will use one strip and part of the other strip. These will be pieced together upon application. Very gently – melt chocolate. I rushed this process in the microwave, and the chocolate bloomed a little, so do this in a double boiler. Examine the transfer paper to make sure you are applying the chocolate to the correct side. You should notice the correct side is less shiny and you can feel the design if you lightly touch it. Using an off-set spatula, thinly spread chocolate over the transfer pieces. Let stand until chocolate loses its gloss but is still malleable. This takes 5-10 minutes, depending on the humidity in your house. Wrap cake with transfer sheet. The large piece will go most of the way around the cake. Place the smaller piece side by side (no overlapping!) in the gap the larger sheet did not cover. If you are using the same technique I did, you’ll need skewers or toothpicks to hold the transfer sheet upright above the cake’s surface. Place them around the inside edge of the cake to hold the transfer paper in place. Let chocolate harden completely. You’ll know it’s ready when the chocolate is completely rigid. Peel off paper, revealing the honeycomb print and embellish as desired. Note: I created an organic shape by snapping pieces off the top edge of the chocolate and used the pieces to decorate the top of the cake. Well aside from being completely and totally gorgeous - that honey cake sounds insanely delicious! Oh how I wish this was in my kitchen right now!! Maybe it's not perfect as perfect-magazine-desserts, but honestly i'm impressed. It is really a beautiful cake you made and it looks pretty good! The chocolate transfer sheet makes such a huge difference. And the cake looks extremely moist. This cake must delicious! That is a divine combinaton. Beautiful. I love the video, and transfer the cake, is original. Greetings from Madrid. It's gorgeous! And I passionately love Valhrona chocolate. It basically makes the cakes itself. It can completely change the consistency of a cake for the best! Your videos and cakes are great!! another work of art! truly! i just finished baking …or rather burning...a disastrous german apple cake…& took a break from cleaning "the mess" to find your beautiful & inspiring post!! thank you. Wow, Heather, you do such glorious work. I just said to myself again, "Man, this woman should have a show on Food Network or at least a book." Then I saw your tab, giving the latest on your book, but saw you are still working on it. You do such beautiful work, you revel in it and it shows. PLUS, your photographs are to die for! You are everything rolled into one. Plus you are pretty and you have cute dogs too. 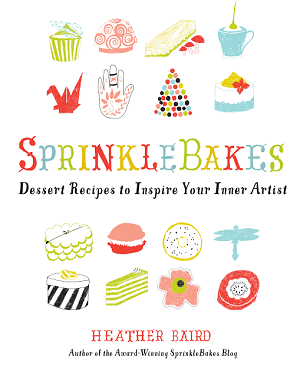 Hey, this is turning into a Heather/Sprinkle Bakes "Love Fest!" LOL! OK, I'll admit it... this is your Mother. ONLY KIDDING!!!!!!!!!!!!!! LOL! I'm just the biggest fan. Seriously though, every time I come on this blog (I subscribe to your email for posts too, so I get them in my Inbox and see what you do), I see such marvelous creations and photos. I wish you all the luck in the world because you truly are the epitome of someone who loves their work. You are blessed in that respect! And we are all blessed by seeing the fruits of your labour. I love the way the chocolate paper sits above and is cracked and uneven, this is a beautiful cake. you are just amazing girl. i hope to get as good as this someday. This is such an adorable cake! I've never use a chocolate transfer sheets before and your video makes it looks so easy! Love your cake! Oh my, this looks incredible!!! Sounds delicious. YUM!!! "The Sting of a Bee" music playing in the background! Unreal! I know you said the honeycomb should fit the cake exactly but Heather, that is so great about your creations...you are an artist! You make beauty from a creation as it happens. Would it be great to have these video inserts on the pages of your book?! Perhaps in an e-book... it would be so fun. So creative. I love the asymmetrical top. Even your so called "flubs" are gorgeous! Recognized this recipe right away. I love nigella! Wow, this looks like a very lovely (and cute) cake! 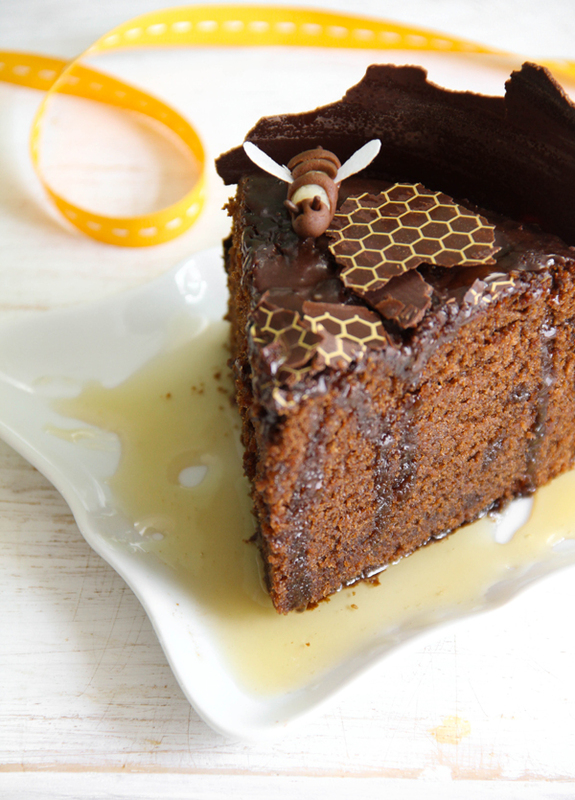 I'm really into honey and I deffinately approve of it being added into chocolate cake. Yum! I've never seen this technique before! I love it and that cake looks sooo moist. I really like your chocolate pattern sheet. Lovely! This is such a beautiful cake! I love everything about it. Thanks so much for making the videos. I LOVE them! Absolutely beautiful. It's a work of art! :-) I loved the video, too! That looks absolutely amazing! I loved the music in the video as well! It looks like something out of a patisserie in Paris! I came over from foodgawker. I rarely click through to recipes that I don't intend to attempt on my own (like this one, which is way out of my league), but I had to come tell you that this is beautiful and impressive! wow!! It looks delicious. I'll put the honey-chocolate cake on my soon to make list. Great photos. 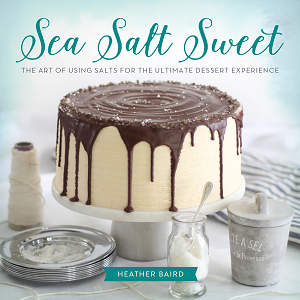 Oh Heather, that is one gorgeous cake. You've just reminded me that I have a chocolate transfer sheet sitting in my cupboards that I have yet to use - not sure I could ever do what you've done here though! wow I can not wait to make this! Might I say that all your recipes have been delicious!!! Thank you for such lovely culinary inspiration. question: Do you think this cake recipe would work for cupcakes? Wow! When I go to your link and I'm waiting for the page to load, I get a little thrill of anticipation to see what's coming up on the screen! Definitely not disappointed. I bow to you master creator!! Beautiful cake, Heather and I LOVE the video!! The music is PERFECT, too!! I need to make this - It looks delectable! omg! What a beautiful cake!! Love it!! And the video is just great! Amazing! You did a wonderful job! I've always been intimidated to do it too and as always, you inspire me to give it a try. Great job and I'm loving the cake flavor! I had some extra honey from my early Spring harvest and made this last night in 6 small spring pans. LOVE THIS CAKE! Super moist, quick, simple and has a wonderful taste that everyone in my family raved about. I did't use the fancy transfer as it's a pretty cake with just the glaze and some almonds but certainly will give it a try on the next batch I make. Thanks so much for posting. It's will be my new fall honey harvest cake at the bee meetings! Oh I love it! I would definitely be scared to do something like this, but you totally executed it like a pro! So cool! Love that chocolate transfer sheet design. Wow, wow, W-O-W! This is so very cool. Rustic and simple, but still so artistic and elegant. You're a truly talented woman, Heather! I too have wanted to try the chocolate transfer sheets to wrap a cake but have put it off. Love the rustic look you ended up with, that works with the honeycomb! I guess I will just have to bite the bullet too. This was inspiring. Wow, this is very nice. I like the flavor and the style. Very gorgeous. nice video .. love your post .. your cake looks amazing and delicious .. thanks for the recipe and for the video .. I've seen those honeycomb transfers! So cute. I didn't know about chocolate with honey until I tried a fancy honey bonbon recently. So rich but so good! And I think the bloom actually gives the chocolate a nice wood-y character. The cake is utterly beautiful. I love how you did the chocolate. 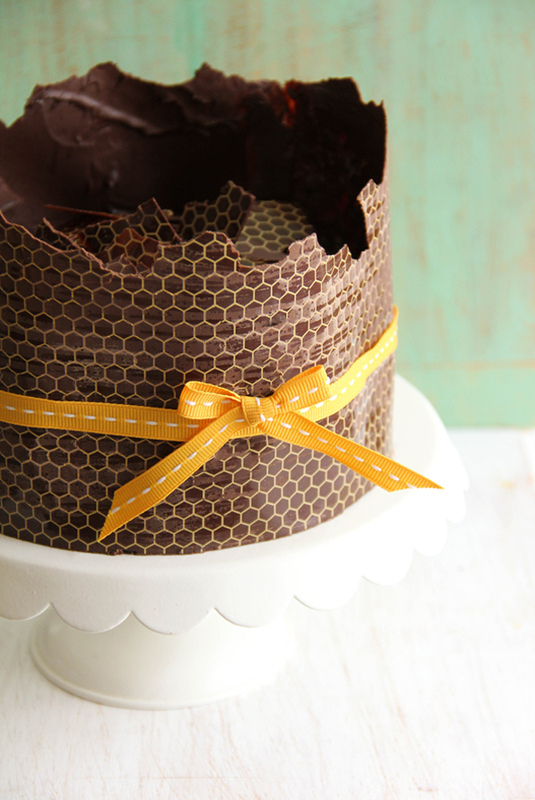 I love the chocolate honeycomb transfer wrapping to the cake!!! It looks amazing, and the bee is so cute! You are so talented. I have made this cake twice now. The first time I just made the cake and the glaze for my brother, he loved it (and my family too) but the glaze went everywhere. The next time I doubled it for my brother-in-law's 40th birthday and I put a chocolate buttercream on it so it would travel easier. I made it on Thursday and then traveled 7 hours with it up the North Island of New Zealand in my chilly bin. We had it on Saturday and it still looked perfect and tasted great. It managed to give 50 peeople a small piece each!! Thank you for your wonderful blog. Oh my God! this is such a pretty cake... I will be making this soon! So beautiful! I think I might even have a photo of this on my Pinterest! What kind of honey did you use for the cake? The desserts, the dogs, the videos, the music! I love your style! This novice baker is inspired :) Cospargere cuoce `e meraviglioso! 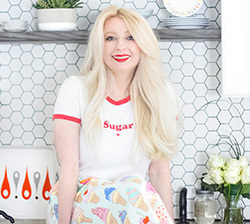 this is so inspiring and the cake is gorgeous! Your video was sheer poetry! Love your work! It looks delicious! thanks for sharing the recipe, I'll surely try it! I made this cake today (minus the transfer paper step) and it was soooo delicious and soft and velvety! At first we were nervous since the batter was SO thin, but it was magical to bite into the cake. And I don't even bake usually :) Thanks!